Supporters of Danny O’Connor waiting for results to come in at his watch party in Columbus, Ohio. A special election this near to the November midterms isn’t solely or even primarily about who won and lost. It’s about which candidate — and thus which party — beat the spread. It’s a crystal ball with a glimpse of the future, beyond the battle at hand and the patch of the country in which it took place. And the vision presented by Ohio’s 12th District on Tuesday night should give Democrats considerable joy. True, the race was too close to call Wednesday morning, and the Republican, Troy Balderson, had a definite edge over the Democrat, Danny O’Connor, in the vote count. But even if O’Connor loses, Democrats will move on from this contest with formidable energy and every reason to believe that Donald Trump is vulnerable, that Republicans are spooked and that the Democratic Party is poised to pick up the 23 seats it needs to reclaim the House majority. This should have been a Republican cakewalk. The district hadn’t been represented by a Democrat in more than three decades. The Republican incumbent, whose retirement is why the special election was necessary, won in 2016 by more than 35 points. In that same year’s presidential election, Trump won the district by 11. [post_ads]And he and Republicans pulled out all the stops to help Balderson. The president swept into town for a big rally on Saturday night. Vice President Mike Pence made his own trip. And Republican groups from outside the district pumped millions into the race, hugely outspending their Democratic counterparts. Even so, Balderson seemed to be barely squeezing out a victory. It’s a terrible sign for Republicans, a promising one for Democrats and a fascinating, revelatory turn of events on a night when the country’s mood in general — and voters’ attitudes about Trump in particular — came into slightly sharper focus. Since his surprising election and the start of an administration with a metabolism and madness like none other, each special election and batch of primaries have provided a bit more information about what Americans make of it, whether they’re willing to put up with it and where the country and its political parties are headed. Tuesday night was another set of clues. Those clues came from Michigan, where the question, to be answered by the state’s Democratic gubernatorial primary, was just how potent the progressive left in the Democratic Party had grown. Two of the left’s brightest current stars, Bernie Sanders and Alexandria Ocasio-Cortez, campaigned in Michigan with Abdul El-Sayed, who aimed to be the first Muslim governor in America. They failed as he was soundly defeated by the choice of the party’s establishment, Gretchen Whitmer. 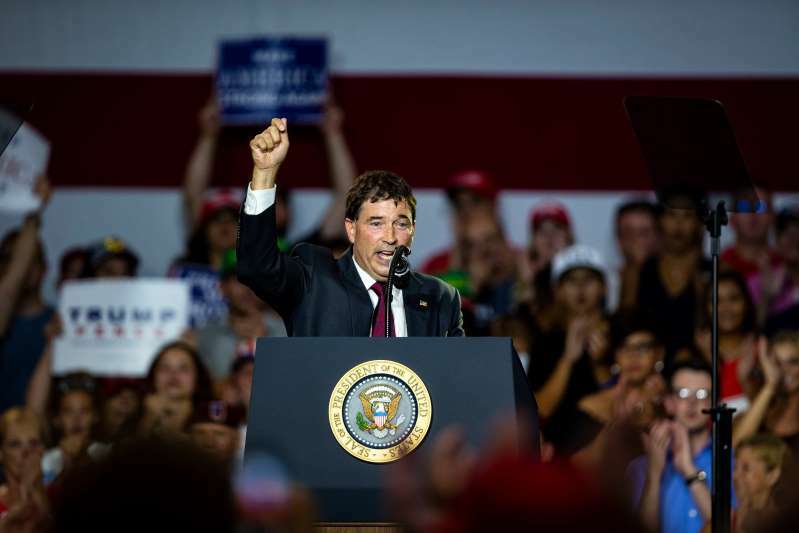 Troy Balderson, the Republican candidate, led Ohio's 12th District race early Wednesday by less than 1 percentage point with all precincts reporting. Provisional ballots are still to be counted. The clues came from Missouri, where Cori Bush, competing in a Democratic congressional primary, also staged a challenge from the left, trying to usurp a Democratic incumbent in a St. Louis-based district. She too didn’t prevail. The clues came from Kansas, where Trump sought to demonstrate anew what he had in previous Republican primaries: the decisive power of his endorsement. He bestowed it upon the underdog, Kris Kobach, who had joined him in his wild, unsubstantiated claims of widespread voter fraud. On Wednesday morning, the vote count remained incomplete and Kobach held a tiny lead over Governor Jeff Colyer, the incumbent, in a race that was also too close to call. Still, it was the 12th District in Ohio that had the most relevance to November and will have the most resonance going forward, and several details of what happened there warrant special mention. Republicans threw their entire negative arsenal at O’Connor, blaring that he favored “amnesty for illegals,” wanted to abolish the Immigration and Customs Enforcement agency and was tight with Nancy Pelosi, their beloved bogeywoman. The Times’s Alexander Burns recently noted that when Pence stumped beside Balderson, he linked O’Connor to Pelosi no fewer than “five times in a roughly 20-minute speech.” And in a shockingly misogynistic ad, Republicans placed an image of O’Connor in a huddle of three supposedly nightmarish mascots of liberalism, all women: Pelosi, Elizabeth Warren and Hillary Clinton. O’Connor absorbed all of this and still turned the race into a nail-biter. Is the Republicans’ preferred playbook as effective as they need it to be? It’s only going to look more frayed and tired as the weeks zoom by. Balderson was a much better candidate than Rick Saccone, the Republican nominee in the special election in Pennsylvania’s 18th District, where Conor Lamb, the Democrat, staged his narrow upset last March. That made O’Connor’s task all the tougher and his performance all the more impressive. I’ve been around the country over the last nine months — Texas, North Carolina, California, Colorado — and know from my own eyes and ears that there are dozens of districts in which Democrats have a significantly better chance than they did in Ohio’s 12th to flip a seat. They’re well aware of that, and they’re plenty buoyed by it. Trump’s tweet late Tuesday night, exulting in “a great victory” for Balderson and claiming it as a validation of his own political superpowers? Like so many of the president’s expectorations, it’s delusional. It’s self-infatuated hooey. And on the morning after Ohio, Democrats aren’t licking their wounds. They’re licking their chops. This article has been updated to reflect news developments.